The news that a pair of Spiders at one boutique law firm — MercerTrigiani in Alexandria, Virginia — are also the current heads of two of Virginia’s most important professional associations raises an obvious question: Why? 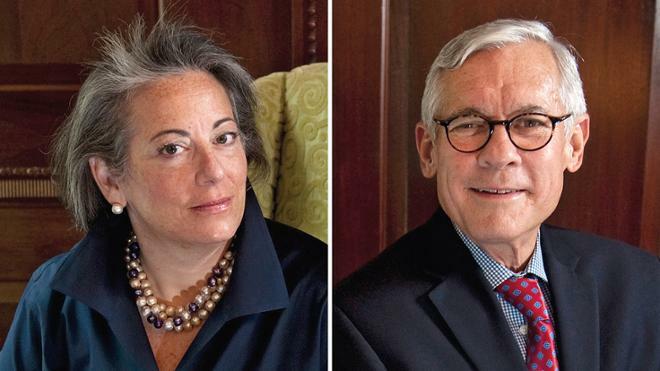 David Mercer, L’73, and Pia Trigiani, L’83, are presidents of the Virginia Bar Association and the Virginia Law Foundation, respectively. It’s believed to be the first time that principals of a firm who are also alumni of the same law school have led two of Virginia’s prominent legal organizations, according to Patricia Hassard, who manages the firm’s communications. One answer to the why question is the one you’d expect. They want to serve their profession. Under Mercer’s leadership, for example, the VBA will open a new headquarters in Richmond this fall within easy walking distance of state and federal courthouses, the legislature, and state agency offices. At least half of its 7,300 square feet will be devoted to a member business center with space for attorneys to work and socialize. But the why question’s other answer is less obvious: The time they take away from their firm improves the time they spend at it. Leading these external organizations is often an exercise in collective problem-solving and consensus-building.